Sitting in the cockpit, sipping thick brown coffee softened with warmed milk, enjoying the tapering fog having just exited the Cape Cod Canal only 24 hours into our journey... wondrous. Sails are trimmed, autopilot is on, Bob is down below working. I can just think, listen, feel and write a bit. Buzzards Bay is uncharacteristically flat and welcoming - yes really. Normally when one exits the southern opening of this 7 mile long canal that connects Cape Cod Bay with Buzzards Bay there is a ferocious salutation of choppy waves and headstrong winds from the culmination of the vast volume of water in Rhode Island Sound and Buzzards Bay being forced northeast by the prevailing southwesterly winds. But today we benefit from the many days of more northerly winds from tropical storm Hermine and the bay is wonderfully serene. Argon is pointed 220T traveling at 5kts, in 11kts of a northwesterly breeze. Healthy breakfast purring along Buzzards Bay. We have transited this canal dozens of times and although one must motor (no sailing allowed regardless of wind direction) we always enjoy the scene of fishermen, cyclists, joggers, other boats, bridges, passing barges, and the Massachusetts Maritime Academy. There was a cheerful yet intimidating overlay of emotion as this canal transit is representing a gateway of sorts; a demarcation between the routine and novel, the familiar and mysterious, the safe and adventurous. My life has had several demarcations (strangely that seem to occur approximately every decade or so) that I normally identify only in retrospect. Some of these demarcations have been punctuated by blessed events, and some have been marked by tragic events; each demarcation represented a meaningful transformation of sorts. I presuppose that this is both a prospective and spirited demarcation. A clear division between phases of life. What will lie ahead? 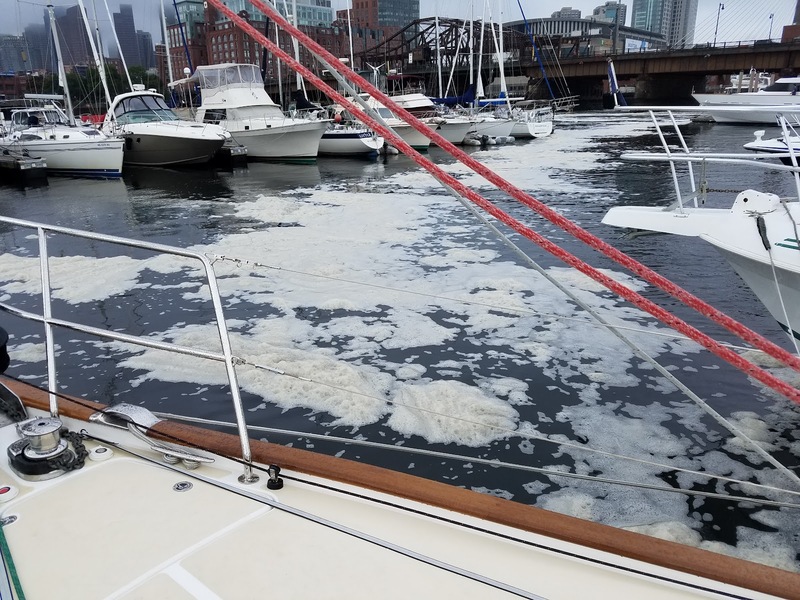 As we prepared to pull out of slip D17 at Constitution Marina for the last time, the Sluice Gates of the Charles River opened to our dismay. 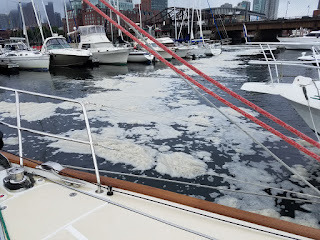 This brings an ugly sludge of algae byproducts down the marina fairway soiling the waterline of boats and, most relevant to us this morning, churning up quite an aggressive current in the opposite direction of our exit. Because of the strong current from the release of the locks, instead of turning hard to starboard to pull forward out of the fairway, I did not fight the current and instead let it take the bow while helpful hands on the finger pier held in my stern to ensure we did not get pushed in to our neighbor. I then hard reversed out of the fairway pushing against the rushing water to make a final successful exit. Must admit it was a bit nerve-wracking to have such a challenging final departure. Constitution Marina and Zachim Bridge as we pull away in the thinning fog. Lifting clouds revealing the familiar and beautiful Boston skyline as we tack gently out of the harbor and up the small boat channel. Ok, Linda... enough with the sentimental good bye pictures! Nix's Mate with the veiled, receding Boston skyline as we pull away. Our only time-dependent obligation currently is to be docked in Portsmouth or Norfolk Virginia by (about) mid October. Wow. After so many years of heavily scheduled lives with endless multi-tasking, we are unencumbered by deliverables, milestones, and schedules. Well, Bob still has 25-30% of a job so I guess he's not off the hook. Will this be an uncomfortable transition or effortless? I suspect the later. 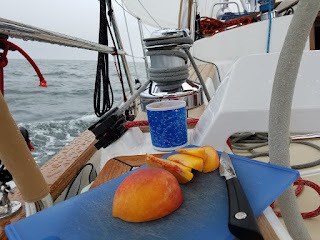 Of course there are various mini time considerations such as meeting up with friends, knowing when happy hour is, being aware of timing of wind shifts, tides and currents (btw... we missed in the Cape Cod Canal current Day 1 - but, hey, that was just fine with us; we are in cruising mode!). Skies cleared as we pulled away from the Boston Harbor Islands. Approaching Minot light sailing close haul in 11kts of breeze on flat seas. ... while Bob gets some work done below. 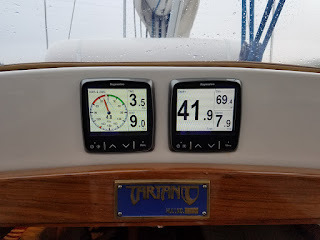 We were being proudly purist sailors leaving Boston Harbor tacking in to light winds against a flooding tide, hence our initial couple of hours had a very lean velocity made good (VMG). But that was just fine. We are sailors, damn it!, and sailors sail, we do not motor (well, unless we have to, and boy that diesel comes in handy sometimes) and although we were planning to transit the Cape Cod Canal catching the progression of the water southward that evening, arriving late simply meant that we could drop anchor on the near side of the canal, get some sleep, and continue on in the morning when the flow was in our favor again. We dropped anchor on the northern side of the Cape Cod Canal off Sagamore Beach at about 2030 the first night of our trip. The canal tide would be in our favor again in the morning. A scrumptious dinner of chili rellenos ended our evening. I think that look in Bob's eyes is famished sleepiness. Another foggy morning as Bob directions me on where to steer Argon so we can haul up the anchor and continue on through the opening of the canal just a mile or so away through the lifting fog. The Cape Cod Canal is 500 foot wide, 7 mile long, 40 foot deep man-made waterway allowing mariners to avoid the often challenging waters around the outer eastern arm of Massachusetts's lovely Cape Cod and shortening the trade route from New York City to Boston by 100km. Interestingly, especially to my many genealogy-loving Perry family members, the idea of constructing a canal here was first discussed by our Perry great, great, great... grandfather, Miles Standish, in the early 1600's. Several waves of planning and evaluations took place over the ensuing 250 years until finally construction began in the early 1900's via a privately funded and owned effort. The initial canal was only one fifth the current width, more shallow, and had a slightly different southerly footprint through Phinney Harbor. The canal experienced several accidents during it's first several years of operation damaging its reputation and limiting revenue. Many boats chose to risk the longer, more difficult passage around Cape Cod until, during World War I, a tug boat with four barges was torpedoed by a German U Boat east of Cape Cod with several crew perishing. This triggered the US government to take control of the canal leading to a swift expansion of the width and depth and altering of the southern entrance by the US Army Corps of Engineers. Interestingly before the modifications in construction, engineers from MIT constructed a large scale model (one mile long!) to study the hydraulic effects of the tidal currents on the new design. The Cape Cod Canal was then able to provide more swift and safe transit north and southward in New England to all commercial and recreational boaters. Now it is very uncommon to travel around the outer Cape and only the largest vessels such as enormous cruise ships and tankers avoid the canal. 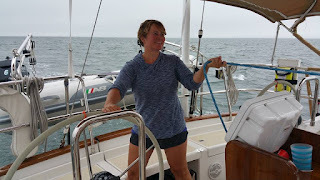 We decided to tackle the challenge of sailing around the outer Cape once (so far) a couple of years ago. We made it so I suppose it can be considered an achievement, but it nearly ended in disaster. Our experience is shared in a the blog post from August 2014 A Tale of Two Extremes: Argon Sails the Outer Cape. Suffice it to say we are very grateful for the safe (and swift) passage option offered by the Cape Cod Canal. And I like to think we are wiser sailors today for the experience. The familiar entrance to the Cape Cod Canal with the fixed FL R 5s 43ft/15M "6" at the end of the breakwater to the right, and the R "4" at the entrance for clear guidance. The current rips strongly at here at peak ebbing and flooding. Passing under the Sagamore Bridge. I have probably driven over this bridge only 4 or 5 times (very unusual for someone that has lived in New England so long given the popularity of the Cape) but I have transited under it with my sailboat (motoring) dozens of time. I much prefer by boat. Bourne Bridge in the foreground congested with traffic. Rail road bridge in the background. One must keep an ear to the VHF and a watch on the RR bridge height to be alert for it dropping to allow a train to pass. Our displays show the effects of the strong tidal current. The 9.0 is our speed over ground (SOG) while the 7.9 is our speed through water (STW). Argon is traveling faster over ground than through the water due to the approximately one and half kt current going in our direction helping to push us along. The Cape Cod Canal has the largest tidal differential of all canals without the use of locks. The strong tidal flow results in up to a 5kt current. Most mariners will time canal transit as not to oppose this strong current for efficiency. 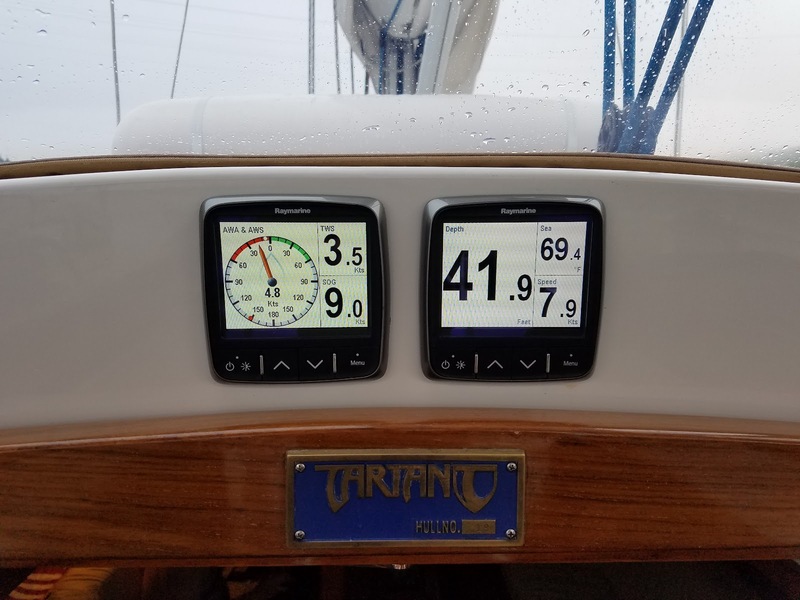 Vessels with modest propulsion such as small power boats and sailboats (Argon has just a 55hp diesel) should always transit at slack or positive current. 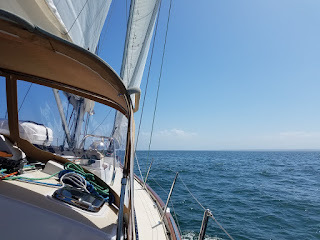 Having fun sailing wing on wing down Buzzards Bay galloping towards the Rhode Island coast guarding the main sheet should I accidentally jybe as the enormous main sail teeters slightly on the lee. Our second evening welcomed one of our favorite anchorages: Third Beach in Newport. Many are familiar with First and Second Beach in Newport that are easily seen driving along 138A. However, opposite and northeast to Second Beach, opening in to the southern out pouring of the Sakonnet River is the more secluded and pristine Third Beach with warm water and soft welcoming sand. Pleasing anchor at Third Beach for our second night of our briny wanderlust. We love Newport. She is cocky and opulent but the huge percentage and variety of sailboats and the ingrained mariner charm weaved everywhere is intoxicating. And as we become even saltier sailors, it is wonderful to anchor for free in a place that easily gets a premium price of $220 to park a boat of our size for just one night. Newport will get increasingly busy in the coming days as she prepares for the annual Newport Boat Show (NBS). Argon was featured in the NBS show last year as part of the Tartan display. See the former post Argon Does NBS September 2015. We will likely stay here in Newport a few days as I have filled our social calendar once again. Lovely Narraganset Bay approaching Newport, RI. Many sailing vessels that dwarf Argon in size and opulence. Look closely... a cutter with a solent rig. Very unusual but cool. Chillin' at anchor in Newport Harbor after a nice, very short work day. 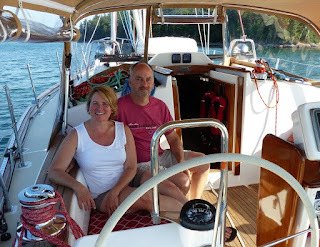 Our lifestyle, sailboat and sailing plans have gotten a bit of attention recently. A couple of months ago we were interviewed for and mentioned in a Sunday Boston Globe article featuring living aboard: What is it like to live aboard in Boston? Unfortunately (or fortunately) we were sailing the lovely coastline of Maine during the photo shoot so no pictures of Argon. Earlier this week Argon was in a movie shoot for an upcoming independent film being shot at many Boston locations: Argon on the Big Screen. Most recently, we were visited and interviewed by the owner of Black Rock Sailing School, Brenton Lochridge. 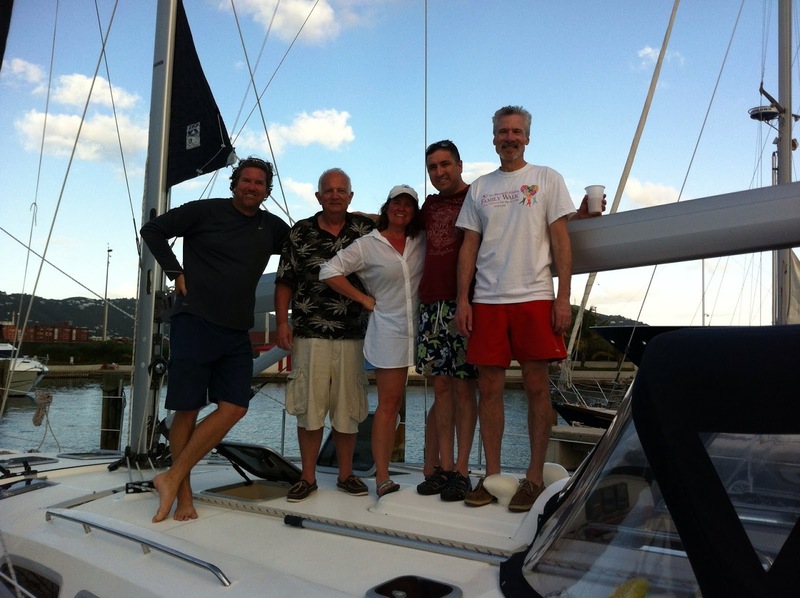 Black Rock is an award winning sailing school based in Boston MA, Warwick RI, and Tortola British Virgin Islands (BVI). Black Rock provided critical instruction for us including docking skills, ASA 104 Coastal Cruising in the BVI, and the especially highly recommended ASA 105 Navigation course. Flashback photo from March 2012 when I took ASA104 in the BVI with Brenton and three other students. Brenton's ASA 104 course was intense with constant sailing, drills, theory, and quizzing as we darted among beautiful islands. The live man overboard drills as well as all manual navigation (no electronics) were particularly instructive. Great visit and fun interview with Brenton and Paul of Black Rock Sailing School. Brenton and Paul of Black Rock Sailing School visiting on Argon. We hope to meet up with them in Bermuda in November and the BVI in the winter as they lead more ASA 104 classes among the lovely Caribbean Islands. We were able to get our final canvas project completed while anchored in Newport. Phil Kinder of Kinder Industries came aboard to finalize the screen to our companionway. Kinder Industries crafted all of Argon's canvas work including the dodger, bimini, solar panel attachments, side panel cockpit enclosures, etc. Phil Kinder installing the snaps for our new companionway screen. Bob calls this our "Zika Screen"
Bob's NY hometown friend has become quite the passionate sailor over the past several years. 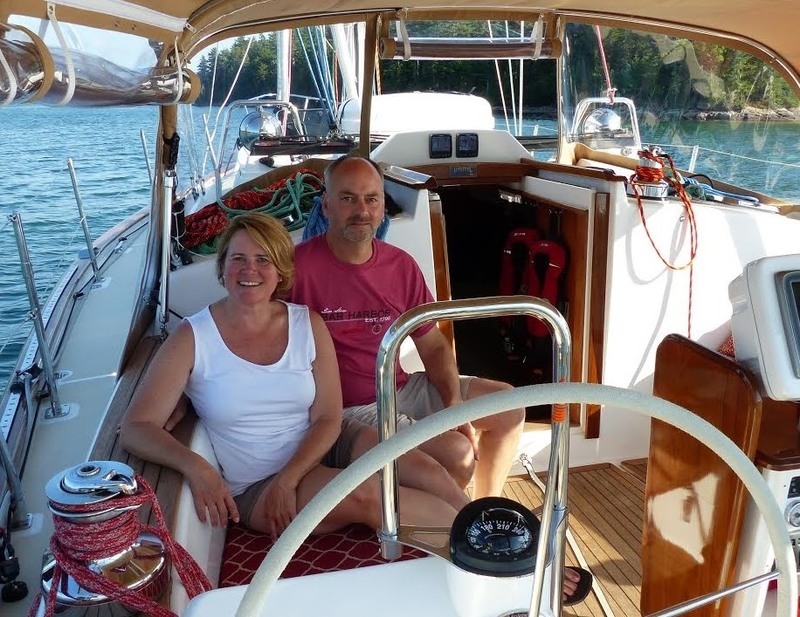 Bob and Greg Ruf enjoy exchanging sailing projects and stories. 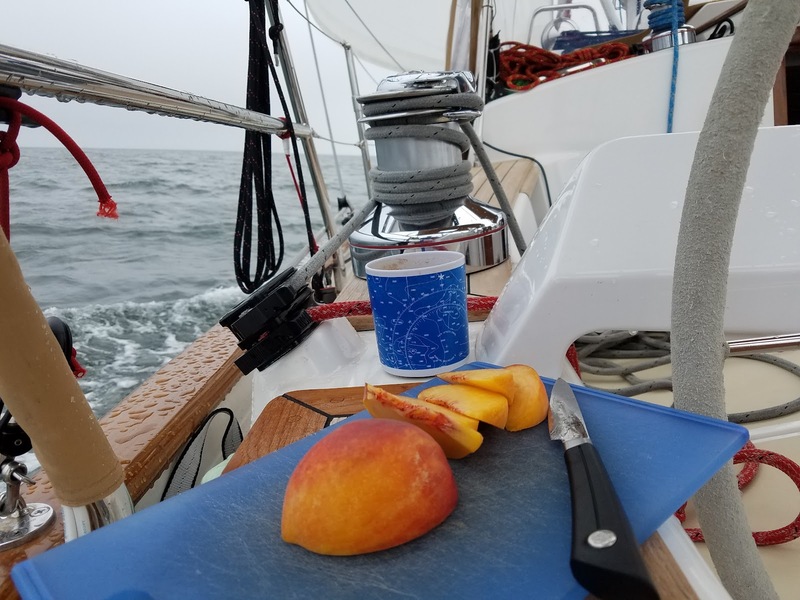 Greg documents his experiences sailing his O'Day 23 at s/v Piao and Ruf Seas sailing blog. .
Bob shuttling more guests to Argon. Argon at her anchorage with Newport Bridge in the background. Now it is time to communicate with our trusty weather router, Ken McKinley from Locus Weather, as we start to look for a good weather window for the ~240nm off shore passage to the southern tip of New Jersey, Cape May, marking our entrance in to new waters as we point southward. In the meantime, we are enjoying the absence of schedules! Until next time.... we AReGONe! Bon Voyage and smooth sailing!